Clackamas County Sheriff's Office is joining agencies throughout Oregon in a two-week "safety blitz" to enforce and educate the public about safety-belt and child-seat laws. The "Oregon Safety Belt Overtime Enforcement Program" continues through Wednesday, Feb. 27. It uses federally funded overtime to allow for increased traffic enforcement, with a focus on seat belts, child restraints, distracted driving, and excessive speed. The statewide effort was organized by the Oregon Department of Transportation (ODOT), in partnership with the Oregon State Sheriffs' Association (OSSA) and Oregon State Police (OSP). According to the National Highway Traffic Safety Administration (NHTSA), in 2015, seat belts saved an estimated 13,941 people from dying nationwide. From 2011 to 2015 seat belts saved nearly 64,000 lives -- enough people to fill a large sports arena. ODOT crash data for 2015 shows lack of safety-belt or child-restraint use was a factor in 79 of a total 289 (or 35% of) motor vehicle occupant fatalities. Motor-vehicle crashes are the leading nationwide cause of death for children ages 1-12. In 2015, 1,353 children under age 9 were injured in Oregon traffic crashes; six children died. It's estimated that car seats may increase crash survival by 71% for infants under 1 year old, and by up to 59% for toddlers ages 1-4. And booster seats may reduce the chance of nonfatal injury among 4- to 8-year-olds by 45% compared to safety belts used alone. 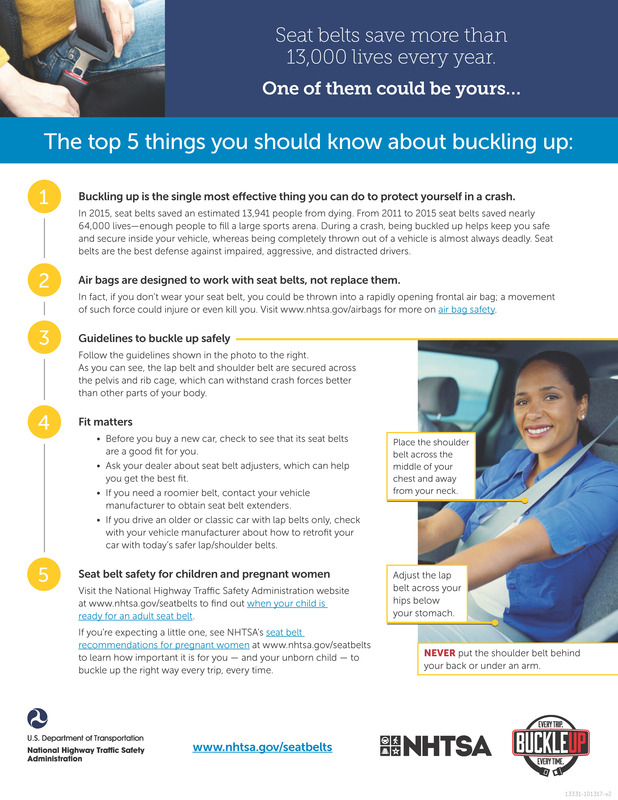 Safety belts, used correctly, can reduce the risk of major crash injury or death by up to 65%. ODOT estimates that at least half of those who died unbelted in 2015 -- 40 persons -- could have been saved if everyone used safety belts and child-safety systems on every trip. Oregon law now requires that children under age 2 use a child seat with harness in a rear-facing position, unless the child turned 1 year of age prior to May 26, 2017. A child over age 2 (or who turned 1 year of age prior to May 26, 2017) must continue to ride in a car seat with harness or in a booster until they reach age 8 or 4'9" in height and the adult belt fits them correctly. Adherence to the law better protects the child's head, neck and spine from potential crash injuries.